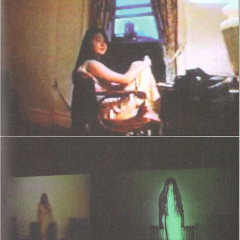 (video installation) I met YUKIKA (her name in translation is „the scent of snow“) at the CHELSEA HOTEL NY in 1994. The very first day i did an interview with her in her room, which is the basis to the video from 2003. That year i went to NYC again, reconstructed the room of the Chelsea by means of a drawn set and made a paper wig resembling Yukika's hair. Then i asked three women (Austrian, American, Japanese) to put on the wig, slip into Yukika’s role, sit down in the same positon as Yukika in the drawn Chelsea room and reecite poems she had sent me throughout a decade.In a show in Vienna the video of Yukika in the real Chelsea and the video of the fake Yukikas in the fake Chelsea were then juxtaposed – so that the “fake” yukikas would answer the “real” yukika in a time warp. The TALE OF GENJI is a novel written by lady MURASAKI SHIKIBU in the 10th century describing the court life of Heian JAPAN. It depicts the life and times of the beautiful prince Genji, who devotes himself to nothing but pleasure. At some point very bored he discovers a ten year old stunningly beautiful girl, with thick and lustrous black hair. Driven by desire he steals her and brings her to his premises in the royal court. There he educates her to become a PERFECT WOMAN - an ideal lover, the ultimate beauty.